We can fix your equipment or we can help you fix it (time permitting). If you haven't already, check out our pages on repairing equipment. We've included some of the more common things that can go wrong. If you don't have the time or inclination to fix your own gear, you can leave it to be looked at. Tag your item with your name and e-mail and any symptoms. There is a $5 charge for us to look at anything, if it's a quick fix, we'll fix it within the $5. A full price list is posted at the armoury, but in general a complete rewire of a a blade including cleaning out the old wire, gluing in new, reassembling the weapon, and testing it will run between $21 and $30 depending on what parts need to be replaced. If you have replacement parts you would prefer us to use, please affix them to your equipment. Do not take any parts out of stock with out asking or without paying for them. Tools do not leave the armoury. Ever. You need to clean up after yourself. Tools go back in their places, they are not left sitting on the bench. Do not disturb any ongoing work. If something is in progress, work around it or come back later. Any parts left become the property of the armoury. There is no way we can sort out who's small partial bag of screws that is, so we aren't going to try. Respect the barricade tape. Some days the armoury will not be open for general use, please respect that. We will generally have a small station setup for tightening handles and other common problems on these days. Body cords come in three types. There are two that can be used for foil and saber and one for epee. An epee body cord is the same at both ends and can be plugged into the floor cord and socket either way. Foil/saber cords are either 2 prong or bayonet at one end. There are three lines (wires) in a body cord. The A line connects to the lame via a 1/2" battery clip. 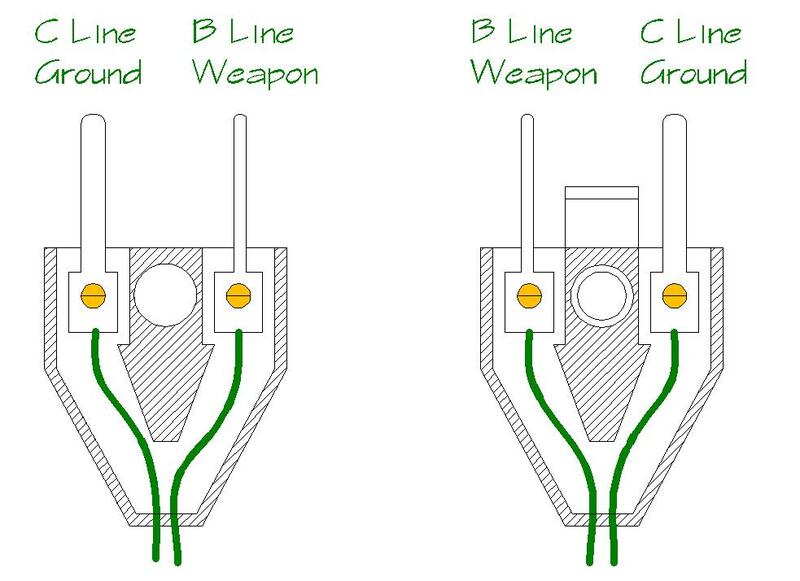 The B line connects to the wire in the foil or the blade in saber. The C line is the ground and connects to the blade in foil and in saber. In a 2 prong socket, the B line is the smaller pin. The matching socket in foil will be insulated from the rest of the socket with plastic washers. 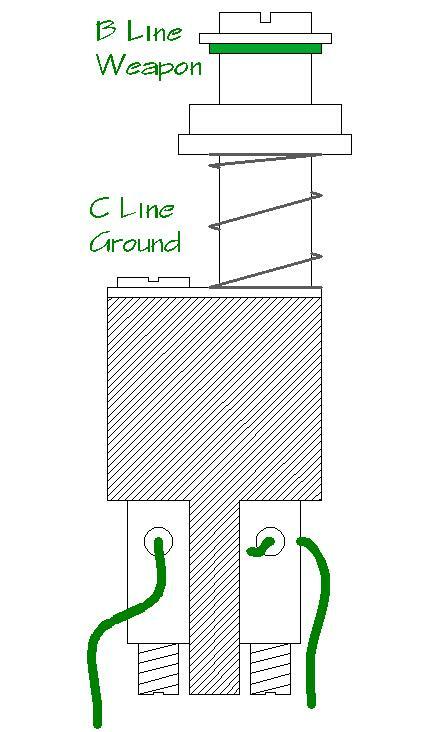 The C line is the bigger pin, and it will be connected electrically to the socket, bell guard, and blade. The end of the body cord that plugs into the reel cord will be the same. The pins are spaced so they only fit into the sockets one way. There are two closer together and one set farther away. When you are putting a cord back together it is important that you check to make sure each line is running to the correct location. Usually when a body cord goes, it’s internal and not something you want to try and take apart between bouts. Foil goes off target when you move your arm - Occasionally the problem is that the springs on the sides of the prongs get compressed and occasionally float in the socket and lose connection causing a white light. If this is a case, you can use a small screw driver to gently pry out the springs. For a fast fix, moisture (either sweat or saliva) to the prongs will work temporarily. Wire corroded - One of the main things that happens to body cords is that the ends get corroded and don't carry current efficiently. This can mimic a broken cord. Your first fix should be take both ends apart, loosen all the screws in the pins slightly and retighten. This will refresh the connections and will fix many problems. Broken Wire - You've checked the foil and it seems fine. Check the body cord and wiggle the wire where it goes into the plastic casing. If you can change the behavior of the weapon with moving the cord, you likely have a broken wire. The fix is to take the body cord apart and trim the wire back past the broken section. The easiest way to determine where the wire is broken is to leave the pins attached to the wire and pull them firmly. One side will slide out with about an inch of wire attached. Se that to measure the break and trim a quarter inch down the cord to get past the corroded wire. Wire not connected to the pins - It happens, the body cord gets tugged and the wire pulls out of the pins. The behavior will be the same as a broken wire, but it's an easier fix since you just need to reattach the wire in the pin. Periodically you should check your cords and make sure all connections are tight. 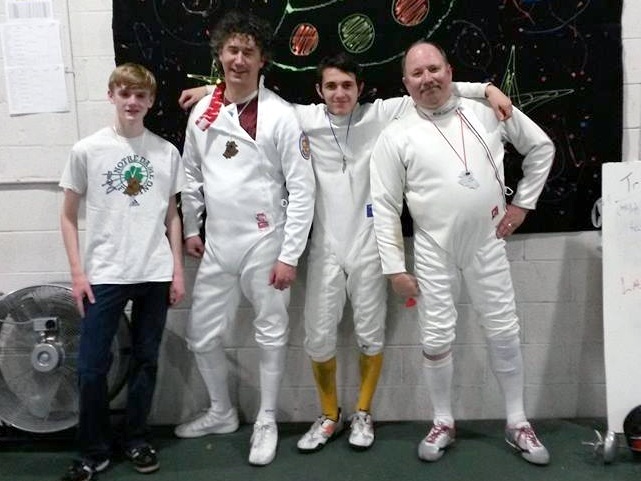 The epee is a point weapon. In electric fencing this means that touches are scored by depressing a spring loaded tip against any part of the opponent. 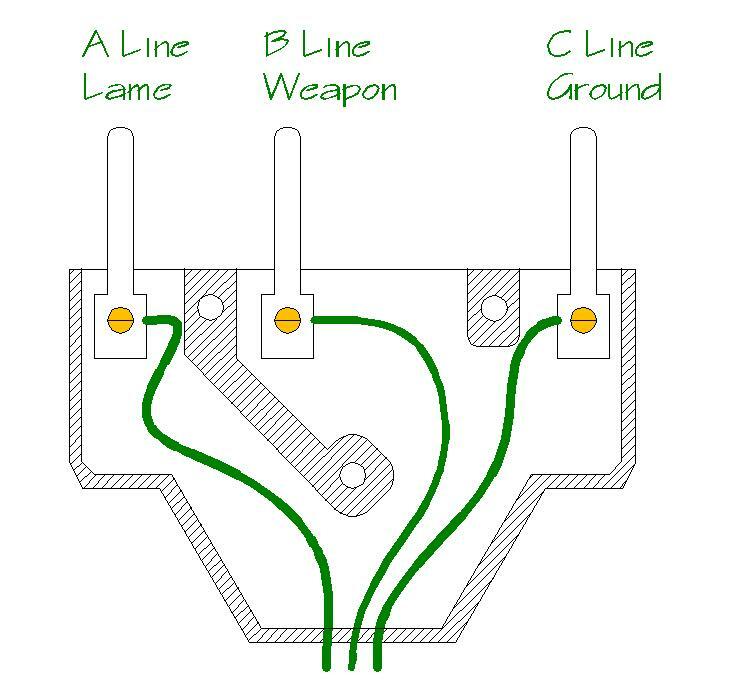 An electric epee consists of a blade, tip, wire, spaghetti (short length of tubing protecting the wire), bell guard, socket, guard pad, grip, and pommel nut. The socket always has three openings and the body cord can be plugged in on either end. The two wires connect to the two pins closest together. It does not matter which wire goes to which pin. The opening the is set farther away should be connected to the metal arm of the socket, usually with a flat piece of metal under the screw and bent to touch the arm. The groove is either cut into the blade or formed as a "V" shape in the blade. The two wires should be glued firmly in the bottom of the groove without an excess of glue. The spaghetti should cover the wires from the bell guard to the socket and a separate piece should be used for each wire. Tips can be several types. The two most common are French and German. 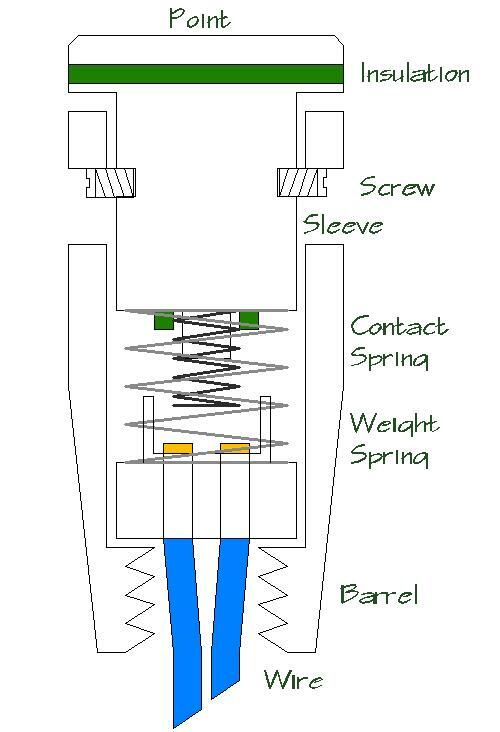 The epee tip consists of two wires, a barrel, a pressure spring, a point assembly, a contact spring and usually two screws. The main difference is the end of the wire and the cup that holds the leads. French is usually just a slightly raised platform. German wires are more cup shaped where the weight spring and contact springs fit. There are also Chinese and Zip Tips. 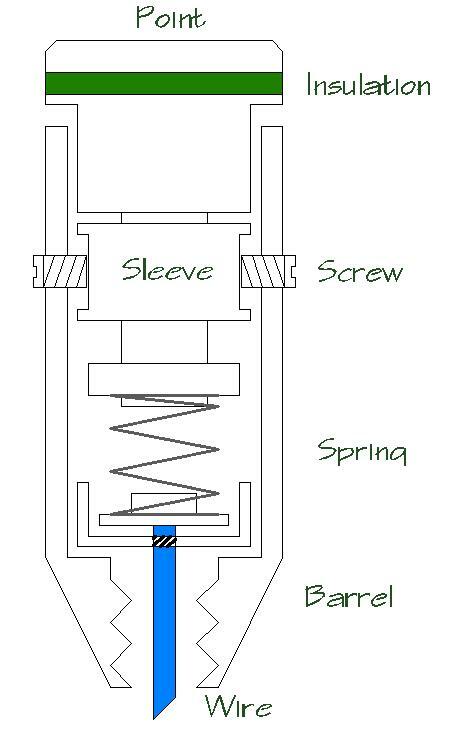 In a Chinese point, there are no tip screws, the point threads directly into the barrel and the contact spring is adjusted by a screw in the center of tip. Zip Tips use a spring action instead of screws to secure the tip in the barrel. 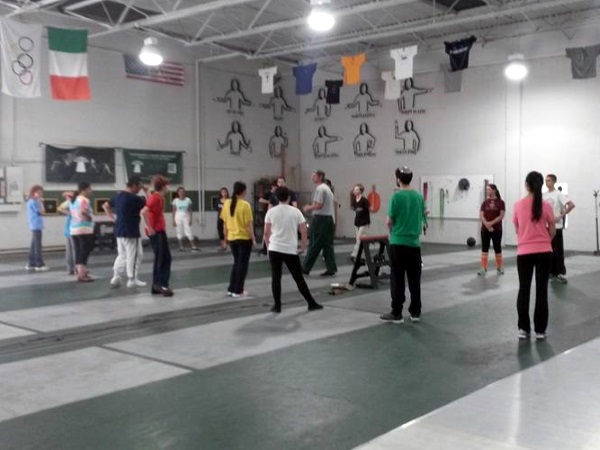 Epee points need to pass a weight test of 750 grams when held perpendicular to the ground and two shim tests. One thick shim to assure there is proper distance between the point and the barrel. The other thin shim to assure the contact spring isn't too long. At rest, the thick shim should fit between the point and barrel without sticking. Compressed with the thin shim between the point and barrel, the touch light should not go on. Missing screws - Very common in epee and also an easy fix, just replace the screws before you fence again. Check these before your bout and tighten them periodically. Light doesn't go on - Test the weapon lightly against a non-grounded surface like your shoe. If the light still doesn't go on it, could be one of three things. 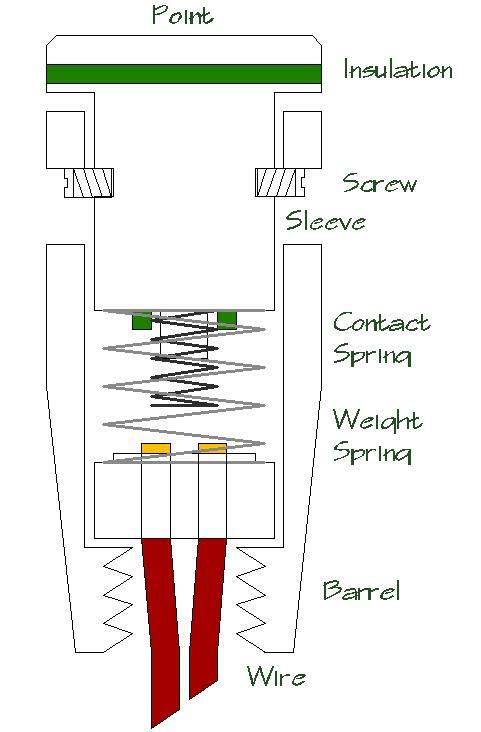 A contact spring that is too short, a broken wire in the epee, or a broken wire in the body cord. Visually check the wires to see if there is an obvious break either at the socket or along the blade. If it's not the body cord and there is no obvious break in the wire, hook the weapon to a box or a multi-meter attached to the two wired sockets. You can verify the wires are intact by removing the tip assembly and using a small flat screwdriver to touch both contacts while the weapon is hooked up to a box or a multi-meter. If the light goes on or resistance approaches 0 then the wires are fine. Contact springs generally need to be replaced when they get too short. Pull the old one out and install a new one, threading it on the center post. Be careful you don't put it on too short, test and adjust by half turns until you get the right length that will score a touch and still pass shim. Bell guard isn't grounded, gives a touch to the opponent - Check the socket and make sure that the plate under the C line is touching the arm of the socket Tighten the two screws that hold your socket together, these will loosen over time. The foil is a point weapon. In electric fencing this means that touches are scored by depressing a spring loaded tip against the lame fabric of the opponent. An electric foil consists of a blade, tip, wire, spaghetti (short length of tubing protecting the wire), bell guard, socket, guard pad, grip, and pommel nut. Sockets are either 2 prong or bayonet. The wire connects to the insulated smaller socket on a 2 prong, or the small screw on the side of a bayonet socket. The wire should be covered with the spaghetti tubing from the socket to just past the outside of a bell guard. This protects the wire from abrasions. The wire cannot be taped down or hidden in any way. From the bell guard, the wire should be glued firmly in place in the groove of the foil and should not stick up anywhere along the length of the blade. The foil wire will end in a cup assembly inside the barrel. Wires are sold with the cup assembly attached. There are several types of foil points, the most common are French and German. The foil tip consists of a single wire, a barrel, a pressure spring, a point assembly, and usually two screws. The tip of a foil is taped down the blade for a length of approximately 15 cm. The main differences between the types of tips are how the screws attach. In a French foil tip, the screws connect directly into a brass collar. You have to line up the threaded holes on the point with the holes in the sides of the barrel. In a German tip, the screws are set screws and just need to catch the collar in the point. The threads are in the barrel itself. 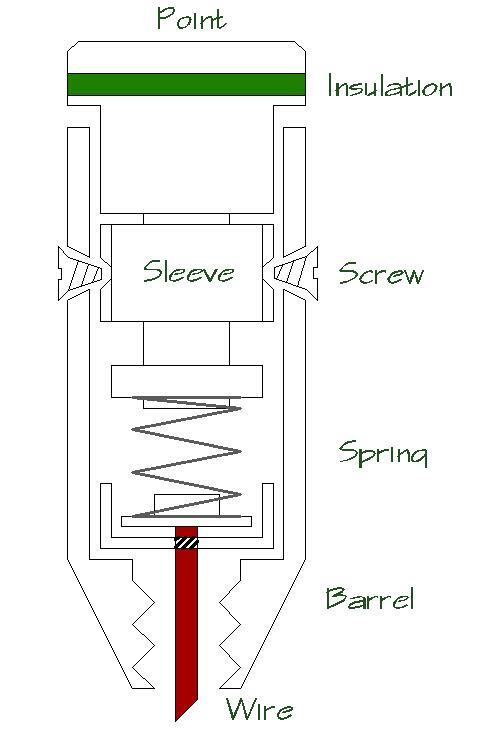 In a Chinese point, there are no tip screws, the point threads directly into the barrel. Foils need to pass a 500 gram weight test when held perpendicular to the ground. The weight should go over the tape smoothly. Foil failed weight - This is one of the most common problems. An easy strip side fix is to take the tip out (making sure you don't lose any screws) and pull out the weight bearing spring. Gently stretch the spring and reassemble the point. If you get a chance, have a club mate test this before you present it again, while it works 80% or the time, there is a chance it won't. Weight stuck on foil - This is caused by too many layers of tape on the tip. Remove all old tape before adding new. Too much tape can prevent the weapon from being tested and will result in a confiscation for the duration of the bout. Missing screws - More common in epee than foil, also an easy fix, just replace the screws before you fence again. Weapon is intermittently off-target - This could be a loose barrel. Remove the tape at the tip and tighten the barrel. Then replace the tape. If this doesn't fix it, there could be a bad wire. Rewiring a blade cannot be done between bouts. Find a new back-up weapon for the day. Weapon is always off target - There is one easy fix, check the wire at the socket. If it's broken off there and you have enough slack to reconnect it, do so. If you don't see anything wrong, your blade will likely need to be completely rewired. You hit, but no light goes on - This could be caused by a lack of tape at the barrel. Make sure that your tape is in good shape and goes right up to the edge of the barrel. If is ragged, remove all of the old tape first and apply new. The sabre is the only slashing weapon. Sabres score a touch when any part of the sabre blade comes in contact with the opponents lame. A sabre consists of blade, guard, socket, pad, insulated nut, insulated sleeve, and grip. 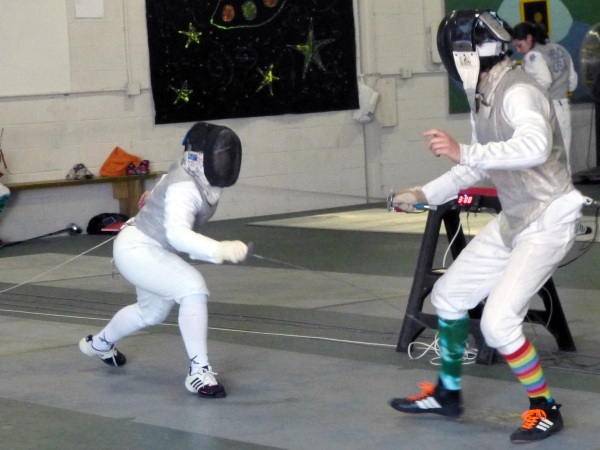 Unlike foil and epee, the guard curves and attaches to the base of grip. Sockets are either 2 prong or bayonet. 2 prong sockets will not have any plastic insulating washers. Bayonet socket should have a short wire connecting from the side screw to the arm of the socket. There is no wire in sabre, the blade itself is the wire and should be electrically connected to both the B and C lines of the body cord. Sabres are the easiest of the weapons to maintain. There are no moving parts and no fine wires. Touches are not scoring - Verify that all the parts are touching and the the socket is in contact with bare metal on the guard.